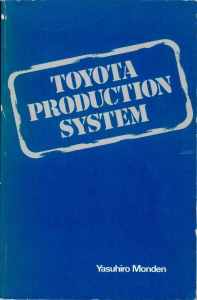 Years before James P. Womack and Daniel T. Jones helped give us the popular version of Toyota’s production system, “Lean production,” there was a professor in Japan seeking to carefully understand and document in detail Toyota’s production system and their overall management system. That professor was Yasuhiro Monden (learn about Professor Monden here). Professor Monden’s books have been essential reading to help me gain an accurate understanding of TPS and Toyota’s overall management system. But, not for the purpose of copying it. For me, and for you, the purpose is understanding so that we think and adapt TPS to our unique situations and evolve it according to actual needs, while maintaining fidelity to purpose, goals, and sub-goals. Reading these books will help you gain a much better understanding of TPS and focus your efforts, which, if you are like most Lean practitioners, have drifted significantly since the introduction of gemba walks, value stream maps, A3 reports, and the like. Professor Monden gave us the first detailed understanding of TPS, beginning with his book, 1983 book, Toyota Production System: Practical Approach to Production Management. Read the first edition followed by the more detailed and expansive 4th edition. It will show you how much you don’t now. The Foreword to the first edition was written by Taiichi Ohno. It is only a little more than one page long. But, as always, Mr. Ohno has interesting things to say, some of which bears repeating here. Why? Because the community of Lean promoters and practitioners are rapidly losing sight of the purpose, goals, methods, and way of thinking of TPS (inclusive of The Toyota Way) due to strange ideas, odd influences, and impractical business policies. In other words, use your head, not money. Toyota was in a competitive marketplace and had visions of domestic and global growth that drove the need to increase productivity and reduce costs. TPS was created in response to practical business needs. Is your situation different? Not likely. What is your purpose for pursuing Lean? Is it driven by practical business needs or by fashion? By costs, Ohno means all costs, not just manufacturing costs; all costs past, present, and future. Do you investigate, one by one, the causes of various “unnecessaries” by trial-and-error? Or, do you apply the same old solutions to recurring problems, whose causes remain unclear, using value stream maps and A3 reports as justification and to obtain management approval? Chances are, you are like me: We – including Womack and Jones – are foreign people. Have we put in the necessary daily study, experimentation, and practice to understand it? The answer for the vast majority of people, if we are honest, is “no.” But, don’t let that get you down. Instead, it should inspire you to learn and do more. Professor Monden’s books will be a big help to you. Have you ever heard it put that way? Has the popular version of TPS, Lean production, made this clear to you? Remember, we must think and adapt TPS to our unique situations and evolve it according to actual needs while maintaining fidelity to purpose, goals, and sub-goals. Is that what you are doing? If not, you need to make some major corrections.